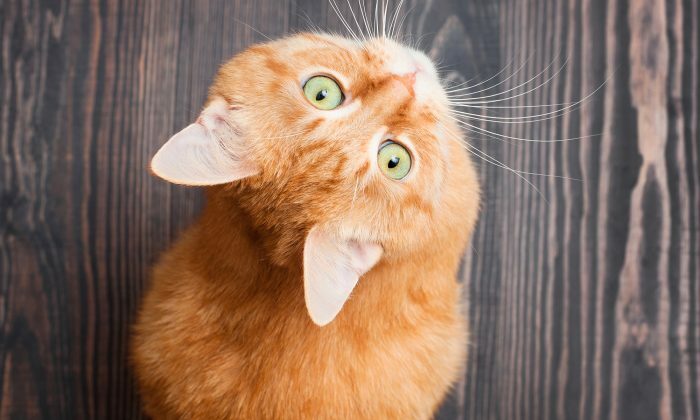 On Valentine’s Day 2017, a couple set up a trap to capture a stray ginger cat living on the streets of California, because they noticed something odd was firmly fitted around his neck. Whilst it wasn’t an easy task, they were determined to catch him. The trap was placed by Kimberly Saxelby and Chris Gattas, 2 feet away from the stray cat, which lay under a parked car for an hour. Knowing that the ginger cat might not enter their trap, they were left with no choice but to capture him with their nets. “After chasing him for a while and cornering him into an old shed that is when Chris was able to catch him with the pole net as he tried to run out,” Saxelby told Love Meow. The poor cat actually had a tape roll tightly wrapped around his neck. Many people, including rescuers from Animal Control, had previously attempted to catch him but failed, as he was simply scared of humans. As the cat quietened down, they started to examine his injury. The cat’s rotting flesh on his neck “smelled like death,” and they believed the tape roll could have been there for months. They then took the cat to Rancho Cucamonga Animal Shelter to be treated for his injury. “Little did we all know after we sedated him just how bad his condition was till we cut the tape roll off his neck,” Saxelby recalled. Seeing the cat’s severely infected neck, Saxelby cried. She couldn’t imagine the pain he had been through. On top of that, the injured cat was emaciated and dehydrated, as he couldn’t drink or eat well due to the tape roll firmly stuck around his neck. Fortunately, the vets were able to treat the wound around his neck and above his ears, after which, he was on the road to recovery. In honor of the day he was saved, the ginger cat was named Valentine. A few days following his rescue, Valentine began to regain his health. Valentine was initially grumpy and defensive, but slowly, he began to be more trusting toward humans once he was placed in a foster home. “The foster mama was able to pet his head and lets just say it made us ohhh so happy! !” Saxelby wrote on Facebook page Saving Sweet Valentine. With a lot of TLC, Valentine adjusted fairly quickly. He loves sleeping in his favorite spot—the sink! Valentine has gone through much misery, and Saxelby hoped he could find a loving home he truly deserves. Just look at how handsome he is now! Kudos to Saxelby, Glatzel, and all other rescuers for giving Valentine a second chance at life!